A down-on-his-luck crab fisherman embarks on a journey to get a young man with Down syndrome to a professional wrestling school in rural North Carolina and away from the retirement home where he’s lived most of his life. The Peanut Butter Falcon is directed by Tyler Nilson, Mike Schwartz and was released on TBA. 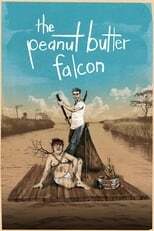 Director Tyler Nilson, Mike Schwartz's Adventure movie The Peanut Butter Falcon is produced by Armory Films & Nut Bucket Films & was released 2019-03-09.